Barring a bizarre set of results, Luton Town secured themselves a League Two play-off place with a 2-1 victory over Notts County this afternoon. The Hatters had to do it the hard way too, after conceding early on to Elliott Hewitt's smartly taken goal after just six minutes, Ollie Palmer restoring parity 10 minutes later, with Pelly-Ruddock Mpanzu's striker in first half stoppage time proving to be the winner. 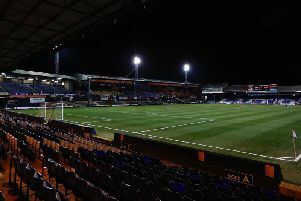 Hatters remained in fourth place, with results elsewhere ensuring Town are now six points clear of Mansfield in eighth, with a goal difference of 17, meaning it would take a goal swing of vast proportions to dislodge Nathan Jones' side from a top seven place. The visitors moved ahead on just six minutes when cross from the left in saw Jon Stead up for the aerial challenge, with the ball nodded out as far as Hewitt, who clinically sent his first time effort beyond Stuart Moore. Where the marking was, was anyone's guess though, as just as they had at Mansfield last week, Town's midfield didn't pick up the runners again, as although the finish was superbly executed, the County midfielder was in splendid isolation in which to do so. Luton almost hit back instantly, Mpanzu's heavy touch falling perfectly for Dan Potts, but he could only find the side-netting. Town weren't behind for long though as Hylton took aim from 25 yards out, curling a stunning effort that took Adam Collin by surprise, crashing against the underside of the bar, with Palmer reacting quickest to power his header beyond the despairing dive of the Magpies keeper. County had an opportunity to regain the lead on 22 minutes, Glen Rea committing himself too easily allowing Stead to dig out a cross for Jorge Grant to flick over. Olly Lee went it alone from distance, before Hylton picked up a booking that was yet another to be filed in the category of totally needless, jumping into Collin after the keeper had caught a high ball. Luton's leading scorer then almost turned provider, cutting back for Mpanzu, but eight yards out, he skied disappointingly over, before the pair almost combined again, Mpanzu's dinked cross met by Hylton, who couldn't get the power to beat Collin. Town completed the turnaround on the stroke of half time as D'Ath found Mpanzu on the edge of the box, whose first time shot had just enough on it to beat Collins' scrambling dive and nestle in the bottom corner. Clearly wanting to banish the memories of their start to the second half against Leyton Orient on Good Friday when they saw a 1-0 lead become a 2-1 deficit, Luton began strongly, and should have added to the advantage immediately, Hylton bearing down on Collin, only to somehow flick wide. Potts was the next to go close, his downward header at the far post cleared by a covering defender, while a slip from Collin in clearing gifted Palmer a difficult chance from distance, as he couldn't lob into the empty net. Town were forced into a change with D'Ath, who had impressed once more in the midfield battle, hobbling off and Jake Gray on after the hour mark, while on-loan Reading keeper Moore continued to show signs of his clear improvement since getting a run of games, flicking a glove out to tip over Adam Campbell's curling effort on 65 minutes. Hylton wasted another wonderful chance to make the result safe, as played through by Mpanzu, he was one-on-one with Collin, the keeper saving with his legs and stretching out a hand to push the loose ball behind. The keeper's next work was far easier, fielding Alan Sheehan's free kick from range, with sub Gray scuffing a volley wide after Vassell's break. Moore was called into action on 83 minutes, making a good parry from sub Mark Yeates' blast, while it clearly wasn't Hylton's day as he took on half the defence, somehow fashioning a shooting opportunity, only to whistle wide. The Town keeper then commanded his area superbly late on as County slung their crosses in, one punch through a crowd of players showing just how high his confidence levels have become in recent weeks. In stoppage time, Hylton picked up a controversial second yellow, as he didn't retreat in time from a free kick to earn a warning from referee David Webb, while he then tangled with Carl Dickinson from a ball forward to earn his second caution and early bath. It means he will be suspended for the final two matches of the season against Accrington and Morecambe, starting the play-off campaign back on 13 bookings once more. Hatters: Stuart Moore, Scott Cuthbert (C), Glen Rea, Alan Sheehan, James Justin, Olly Lee, Pelly-Ruddock Mpanzu, Lawson D'Ath (Jake Gray 60), Dan Potts, Ollie Palmer (Isaac Vassell 72), Danny Hylton. Subs not used: Craig King, Jonathan Smith, Luke Gambin, Jack Marriott. Mapgies: Adam Collin, Carl Dickinson, Richard Duffy (C), Haydn Hollis, Shola Ameobi, Robert Milsom (Mark Yeates 81), Jorge Grant, Elliott Hewitt, Josh Clackstone, Adam Campbell (Tahvon Campbell 89), Jon Stead (Jonathan Forte 72). Subs not used: Alan Smith, Curtis Thompson, Joe Searson-Smithard, Alex Howes. Booked: Hylton 26, Grant 31, Dickinson 49, Hollis 76, A Campbell 89, Mpanzu 90. Hatters MOM: Pelly-Ruddock Mpanzu. Midfielder was back with a bang.